Where you end up spending the night can make or break your vacation. We may not want to spend a lot of time in our rooms, but we want them to be clean, comfortable and affordable. With all the visitors to West Michigan, there are a variety of hotels, motels, resorts, cottages, and bed & breakfasts from which to choose. Some are tailored to families; others are perfect for a romantic getaway. Hotels and motels are easy to find in travel destinations around Lake Michigan. From West Michigan to Northern Michigan, these lodging facilities welcome you and are ready to make your stay an enjoyable one. Most offer complimentary coffee or breakfast, pools, air conditioning - and best of all, they're just minutes from Lake Michigan beaches. Clean and affordable, with a variety to choose from - hotels and motels along Lake Michigan offer everything you're looking for in travel destination. When you choose to stay at a charming bed and breakfast, it promises to be a vacation within itself. These lovely turn-of-the-century homes are generally just a short walk to downtown shops, restaurants and marinas. The innkeepers of the historic bed and breakfasts give you that special attention that make you feel part of the family. Scrumptious breakfasts, Jacuzzis, and fireplaces are just some of the amenities they offer. Watch the world pass by as you sit on the porch with your favorite beverage. 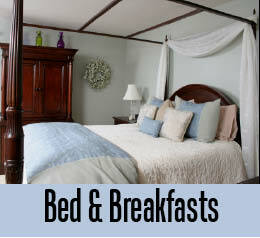 The bed and breakfasts in Lake Michigan travel destinations are an elegant option for lodging. Families taking a vacation to a Lake Michigan destination enjoy staying at one of the many resorts or cottages found in the area. Most are located on Hamlin Lake, a 5,000 acre inland body of water with warm, calm waters. Resorts can accommodate small to large groups, and most offer kitchens, grills, playgrounds, and swimming facilities. The casual nature of resort lodging makes for a relaxing vacation, and a perfect setting for watching the sun set over the water. 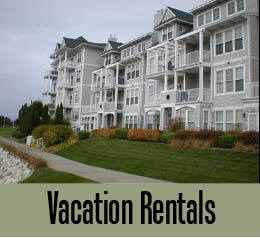 If you plan an extended stay in a Lake Michigan destination, choosing one of the area vacation rentals may be for you. 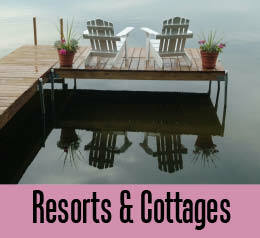 Choose from cabins, cottages, apartments, or condominiums. Some are conveniently located near the downtown region, and others offer waterfront views or access. These rentals are furnished, so your stay is comfortable, carefree, and economical for long-term lodging. Whatever your preference, vacation rentals in West Michigan and Northern Michigan are great alternatives when visiting these wonderful areas along the lakeside. 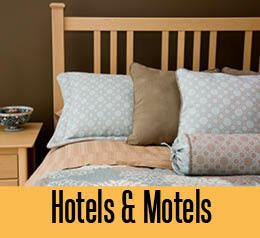 Ludington Area Lodging -- The variety of lodging facilities in the Ludington area is endless. Many Victorian homes of Ludington have been transformed into lovely bed and breakfasts, or choose a family-oriented resort along Hamlin Lake.